Every softener we install has a bypass valve. It allows the water coming into your home to “bypass” the softener should you have a problem or want to use hard water to water your lawn or garden. Culligan uses 3 main types of Bypass valves. The one on your system will be easily identified by looking behind the control head of your system (the box with the clock on top of the resin tank). Most home softeners will have either a “Push to Bypass” valve or a “Turn to Bypass” valve. Compare what you see behind your control head with the example photos you will see next. Locate the Red button behind the right side of the control head (as seen from the front of your unit) . Using firm pressure push the red button in until it is flush with the copper housing. This may require significant force if it has been a while since the system was last bypassed. If you are unable to push it in try turning the red button CLOCKWISE. Turn it one or two full turns to loosen built up sediment on the o-rings inside – DO NOT TURN IT COUNTER CLOCKWISE. You can also try turning on a large faucet such as the bathtub. This will help relieve water pressure on the valve and may make it easier to push. You can also use a rubber mallet to tap on the button to get it started (DO NOT use a metal hammer which might crack the button). 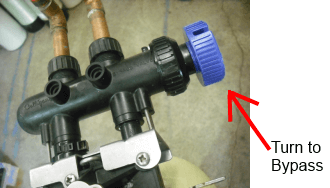 To put your softener back in service, simply push the blue button in on the opposite side of the copper housing until it is flush with the housing. Locate the single large blue knob behind the control head. It can be on the left or the right of the control head depending on installation. Regardless of which side it is on it needs to be turned “clockwise” to bypass. Be sure to turn it all the way until it stops. If it is hard to get started use the shaft of a screwdriver in the slots on the face of the valve so you can use the handle as a lever. To put your softener back in service, simply turn the knob “counter clockwise” all the way until it stops. DO NOT over-loosen or over-tighten the valve to prevent damaging it. When it stops turning don’t try to force it further. The third type of bypass systems used on our equipment is the “3 valve” bypass. It is rarely used on residential systems accept in certain special situations for example when the source water is from a well. It is used extensively on commercial installations (see example photo 3). 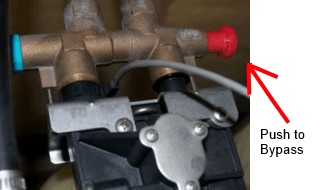 The 3 valve bypass has 2 valves plumbed on either side of the system that are normally “open” and one valve in the middle that is normally closed. 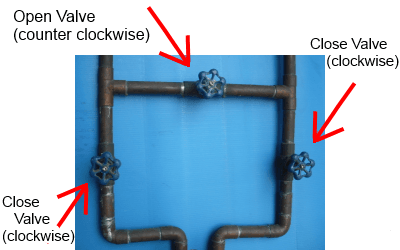 Turn both outer valves off by rotating “clockwise”. Then turn on the center valve by rotating “counter clockwise”. Now the water is flowing past the softener and not through it. To put your softener back in service, reverse the operation – close the middle valve (turn clockwise) and open both side valves (turn counter clockwise). If you are having trouble or are unsure which bypass you have or it will not operate – get in touch with us and we will give you further suggestions or send a technician over to help. If you need to bypass your system because of a leak please call 402.826.3372 or 800.422.6885 right away. We have operators on duty that can get a technician in touch with you for immediate assistance.